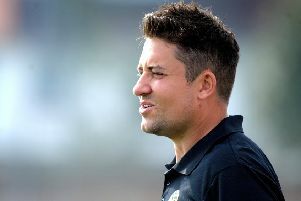 Loxwood boss Alex Walsh feels his new charges will add 'quality in terms of goals and creating assists' as the Magpies look to move out of the Premier Division relegation zone. Picture by Steve Robards. Loxwood have added to their striking options by bringing in three new faces including an ex-Chelsea and Bristol City player. New manager Alex Walsh has bolstered his frontline with the addition of three more forwards after bringing in four players last week. Nicholas Mynhardt and Shabazz Omofe have both dual-signed from Lewes whilst Jason Dawson has been brought in from Montpelier Villa. Omofe has previously played for Chelsea U18s before signing a professional deal at Bristol City, whilst Mynhardt has spent three years at South African top-flight side Kaizer Chiefs. Walsh said: “They’re all attacking minded players. They can add quality in terms of goals and creating assists which is something we need to improve as second-lowest scorers in the league. Mynhardt and Omofe both started in Saturday’s 1-1 away draw against Saltdean, whilst Dawson made a late cameo as a sub. Walsh was particularly pleased with the performance of his starters and backed them to be among the goals. He added: “Nicholas worked tremendously hard and he’s a player that, even in training, we can see signs of a top player there. He’s done well where he’s been but you can see he needs a goal to take the shackles off him and he’ll then start scoring a few more for us.